Joey Bones has had quite a busy year! In 2011, not only did he released the excellent Dust Bowl solo album but there was also a second helping from super-group Black Country Communion with 2 and now he’s partnered up with Beth Hart for a collection of blues, soul and jazz covers. Though there are a number of uptempo moments like “Chocolate Jesus”, “For My Friends” and “Well, Well”, it’s the slower numbers and tender moments that I found myself enjoying most. “Your Heart Is As Black As The Night”, “Don’t Explain”, “I’d Rather Go Blind” and “I’ll Take Care of You” are fantastic soulful and sultry jazz numbers with Beth Hart putting in a great performance on these songs. I know of Beth Hart but I’m not familiar with any of her work but it’s easy to say from this album alone that she’s a great vocalist who can handle either bluesy rockers or soulful ballads. Then, of course, there’s Joe Bonamassa who is proving himself to be one of the greatest guitarists of his generation whether he’s playing blues or straight up hard rock. There’s a lot of great solos and emotional lead work on this disc. An album such as this is not something I would normally try but with the October 2011 issue of Classic Rock giving it a good review (and knowing I enjoyed Joe’s Dust Bowl and BCC works), I decided to give it a shot. A collection of blues, soul and jazz is something I’d have to really be in the mood to listen to but on a cold, dreary Autumn afternoon, it fit my mood and I found myself enjoying it a lot. 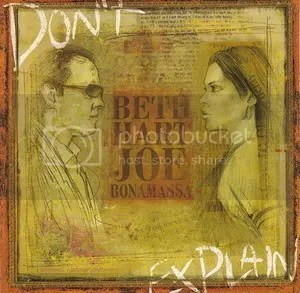 Don’t Explain may not be the album of the year for me and outside of my usual brain-dead listening circle of rock & metal but I found it to be a good listen and fans of both Joe & Beth should check it out.